The Kona World Ironman Championships is over for another year. As part of event registration, the organisers do a count of equipment choices, and this includes power meter brand if fitted to a competitor's bike. 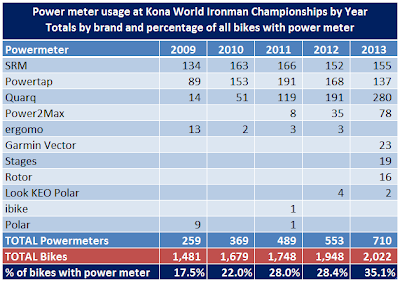 So just for fun, I thought I'd look at the prevalence of power meter usage by Kona competitors for the last five years, including this year. I managed, with a little help from the wattage forum and Google, to locate the data and compiled them into table and chart form. Click on the images to see a larger version. 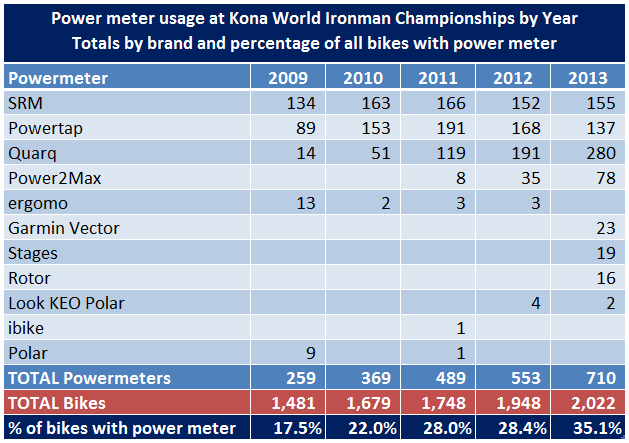 So while competitor numbers at Kona increased by 36% over the five years 2009-2013, the number of power meters installed on competitor's bikes over that same period increased by 174%! We can see three major power meter brands: SRM, Powertap and Quarq, have dominated the Kona power meter landscape to date, with Quarq in particular showing strong growth over this period. Power2Max have begun to make inroads in recent years, and we can also see the emergence in 2013 of newer power meter offerings from Rotor, Stages and Garmin. The old Polar power meter is a distant memory, and ergomo usage never really got going, although a few souls were still using them up to 2012. 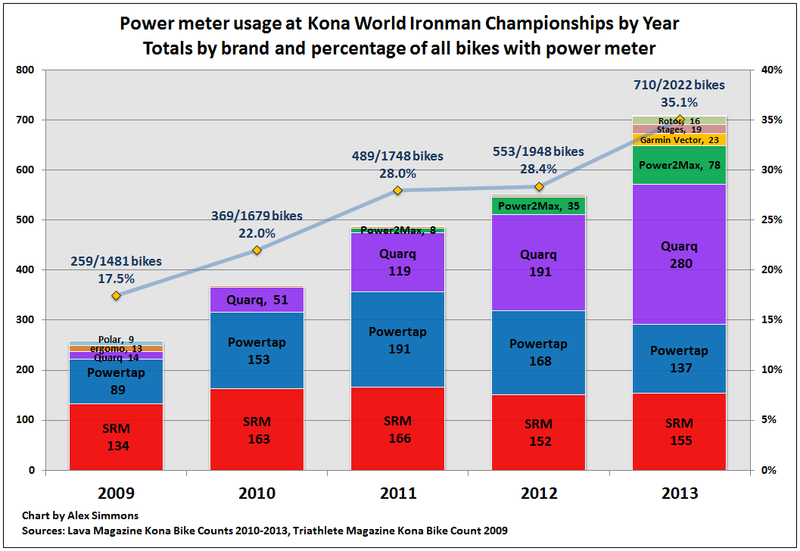 It appears the overall solid increase in usage of power meters by those competing at Kona has largely been satisfied by uptake of newer power meter brands. It would be risky to assume this translates directly into general market trends for power meter usage but it certainly provides a good snapshot of the trends for Ironman athletes. Links were active and available at time of writing this post. @whareagle I would expect head units at the Ironman WC to skew more heavily towards Garmin 310/910XT due to the multisport capabilities of those watches. The count did not cover cyclo-computers. I note that according to the 2013 count, 57% had a coach. The data is not published in database format to enable cross references to see if that subset has a greater prevalence of power meter usage. The coaching question was asked as you left racking so unfortunately could not be linked to power usage as bikes were safely stored away at that point. However, I have a quarq and no coach!